InsideOut Coaching is a client-tested and time-proven process that turns conversations into performance. It’s simple, flexible, and designed to produce real breakthroughs. Coaching works across all levels of an organization. Let us help you create a plan as unique as your vision. Our flexible solutions and customizable implementation drive higher performance. What would your organization look like if every single employee brought their best each and every day? Breakthroughs: High Performance from the InsideOut can help you get there. CoachMasters is an engaging, learn-by-doing and feedback process designed as a next-step for InsideOut Coaching program participants seeking to more fully apply the InsideOut Coaching methodology. InsideOut Coaching LAB propels InsideOut Coaching graduates from knowing how to hold coaching conversations to actively coaching. It turns managers into high-impact coaching advocates. A comprehensive coaching system starts at the top. InsideOut Executive Coaching follows a structured framework, to create a simple results-driven process that enables sustainable business results. 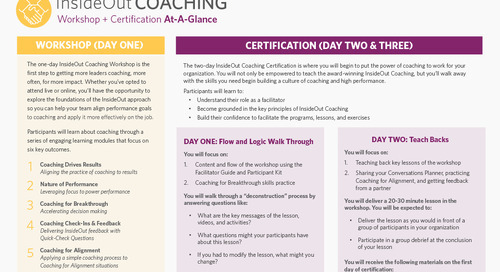 Interested in getting certified to teach InsideOut Coaching at your organization? This guide provides a detailed breakdown of the 3-day workshop so you’re prepared to get the most out of the class.